Two women – one the sister of a missing girl and the other a victim who escaped – come together to unmask a killer in this heart-stopping, unputdownable thriller from a sensational new voice in suspense fiction. Megan McDonald is a high school senior when she disappears from the small town of Emerson Bay. Miraculously, after two weeks held captive, she escapes from a bunker hidden deep in the woods. Now, one year on, Megan is a national celebrity thanks to her bestselling book, Missing. It’s an inspiring story – except for one inconvenient detail. 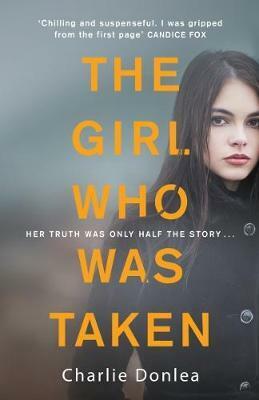 There was a second girl who was taken. Her classmate Nicole Cutty. Livia Cutty is a forensic pathologist. Every time a Jane Doe arrives at the morgue she wonders if it’s her missing sister. However it’s the body of a young man, an apparent suicide, who finally offers the first clue to Nicole’s fate. So Livia reaches out to Megan for help. But Megan knows more than she’s revealed. Flashes of memory are coming together – and they are pointing to something darker and more monstrous than anything her chilling memoir describes. Charlie Donlea lives in Chicago with his wife and two young children. He spends a part of each year fishing with his father in the far reaches of Canada, where the roads end and lakes are accessible only by floatplane. These majestic trips to “God’s Country” inspired the setting for his first book Summit Lake. This is his second novel.